How can your garden grow? Trying to do gardening with a group of 25-30 children is not easy. Curious and energetic, they run here and there, have a million questions and fight with each other for the gardening implements. And then some children, especially in urban schools, have a problem getting their hands dirty, and ask for gloves! But in general, all children love digging, sowing, planting, harvesting, raking and other garden-related activities. I know because I have been working with children for the last several years. 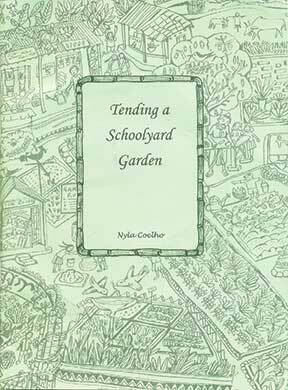 Therefore, when I read Nyla Coelho’s book, Tending a schoolyard garden, I know exactly what she is talking about. Her delightfully detailed book is one of the few books one comes across on gardening with children, and what a rich resource it is! It is essentially a handbook for teachers and is based on field tests, mainly at Anand Niketan, an experimental school in Sewagram, Wardha, Maharashtra. Best practices from field tests that were conducted from 2012-2014 are presented in this book. Apart from the extensive coverage and step by step instructions, the book also provides soft copies of about 130 resources in a CD. This is a very generous offering indeed, but more about this later. This book recognizes the importance of connecting children with the earth and has the noble intention of equipping children with skills that will help them be self-sufficient and find a way to find peace in a complicated world. This is of utmost importance in today’s world when children and adults are becoming increasingly distanced from nature. The first part of the book gives details of gardening with children. Emphasizing that it is important to set aside bookish learning and get back to learning by doing, Nyla Coelho describes the various stages of setting up a schoolyard garden including doing an ecological audit, site selection, and garden design. She points out several other related activities that one can do with children such as having and maintaining a blackboard to record and announce, having a scarecrow, birdbaths and bee boxes, and setting up a compost pit. She thinks of everything – from how to fit gardening into an already busy school schedule to managing children outdoors to monetary implications of an activity such as gardening. Tending a schoolyard garden is thus a primer, not just for teachers in schools, but for a parent or anyone wanting to start a garden. Several ideas are given to suit different kinds of situations. The simple line drawings by Vithal R Badiger are effective and the photographs showing children working in the garden, getting friendly with bees, learning about pest attacks, learning the correct way of washing utensils and so on greatly help keep the reader’s interest alive in addition to illustrating the text. An amazing feature is the delightful illustrated summary of the entire book by Atreyee Day. It shows the whole schoolyard garden landscape with 42 different activities described in the book from a windowsill herb garden to a groundwater recharge pit to an interestingly shaped keyhole garden. The 43rd activity is illustrated on the cover of the CD, where there is an illustration of a fence used for growing bittergourd, with a cow looking quite unhappy eating the bittergourd! Great idea! That this book is carefully thought out comes through on the copyright page itself, where the ‘copyleft’ declaration says that the publishers welcome full use of the information in the book and the CD! The book is sprinkled with ideas for recycling, such as using an old plastic bottle with holes to water saplings, using a shoebox lined with plastic to grow plants, and there’s even an illustrated idea for a dry pit toilet that they use at a learning centre in Tamil Nadu! Notes on pedagogy help the teacher link the gardening activities to other subjects also. For example, a discussion on changes in weather patterns can be followed up by a thematic activity such as drawing, writing an essay, or a poem, which in turn could motivate children to try their hand at gardening. In times of fast food and an excess of junk food, it is good to make children aware of well-cooked food and its nutritional aspects. Nyla Coelho gives a detailed account of how children can be involved in cooking – understanding the science behind different kinds of cooking processes to weighing ingredients, learning about energy resources and to the actual cooking itself. Coelho also gives recipes of healthy and simple food that children can help put together. Green sprouts salad, khichdi, lemon sherbet, and fruit salad are some examples. Coming back to the generous offering that comes with the book – the CD – it contains 130 resources including curricular ideas, lesson plans, teacher notes, workbooks, books, documentaries, and articles. Some amazing books given in their entirety include Charles McCann’s richly illustrated 100 beautiful trees of India, Satpada: Our world of insects by Rebecca Thomas and Geetha Iyer, The danger within – an activity book on occupational hazards, and The humanure handbook: a guide to composting human manure. There are many others also. Tending a schoolyard garden has been well edited and has minimal proof reading errors. If there is anything negative about this book, it is that it packs too much information and sometimes makes you wonder about the practicality of doing all the activities mentioned in a school situation. However, if you are a believer in nature and you see this book, refer to it and understand its intent and user-friendliness, you will feel that you cannot but make it a necessary part of your book collection. All schools everywhere should certainly get themselves a copy and use it well. The reviewer is a writer and editor and conducts nature awareness classes for children. She can be reached at sadhana_bluepencil@yahoo.com. Order your copies by writing to childrenstalim@gmail.com, or sending a postcard to Peoples Books, #5, High Street, Camp, Belagavi 590001. You can also call the following numbers and place your orders: 0831-2460991/9343413193. You will also find the book for sale at The Otherindia Book Store, Goa.